(Nanowerk Spotlight) Decreasing availability of potable water is a crisis in the making and freshwater looks like it will become the oil of the 21st century – scarce, expensive and fought over (see "Water, nanotechnology's promises, and economic reality"). Among various technologies, reverse osmosis membranes have been widely used for water reclamation. However, external energy required and high operational pressure used (above 75 bar for reverse osmosis desalination and 25 bar for reverse osmosis water recovery from wastewater) make reverse osmosis membrane water reclamation processes energy intensive – not exactly an advantage given the rising cost of energy and the negative climate impact of fossil fuels. An osmotic process – a natural phenomenon – is driven by an osmotic pressure gradient across a semi-permeable membrane. Water diffuses naturally through the membrane, leaving behind all impurities. In fact, this process has great potential for various applications including wastewater reclamation, seawater desalination and energy production. Furthermore, this process can also be used for pharmaceutical applications such as temperature-sensitive protein separation. Today, forward osmosis (FO) is a well-recognized osmotic process for producing clean water with a bright future as it uses a natural phenomenon and does not require any operational pressure hence it saves large amount of energy compared with reverse osmosis process. The biggest challenge facing the wide application of FO technology is the economical separation of drinking water from its draw solution. "The problem with today's FO applications is this," Darren Sun, an associate professor at Nanyang Technological University's Division of Environmental and Water Resources Engineering, explains to Nanowerk: "When water diffuses through the selective layer of the FO membrane, the draw solution on the permeate side is diluted substantially, while the back diffusion draws solutes through the support layer and works to compensate the diluted draw solutes. The compensation process is severely hindered by the tortuous, dense and thick support layers of conventional FO membranes. As a result, the competing process between the dilution and back diffusion equilibrates at a transverse draw solute concentration profile, resulting in an Internal Concentration Polarization (ICP) problem." Up to date, all FO studies with commercial and newly-developed membranes showed that ICP results in major water flux deterioration. Especially at higher draw solution concentration, water flux becomes "self-limiting" – a stage when increased osmotic driving force hardly results in water flux increase. This is caused by a much worse ICP as solute concentrations increase. Schematic of an ideal FO membrane with a dense active layer (reject pollutants and salt ions) and a scaffold-like nanofiber support layer. The nanofiber support layer is highly porous and has an interconnected pore structure, which provides direct paths for water and salt diffusion. (Reprinted with permission from Wiley-VCH Verlag). "Apart from avoiding the ICP problem, an ideal FO membrane support layer should also possess non-tortuous, highly porous and very thin structures," says Sun. "However by nature, conventional FO membrane support layers fabricated by the Phase Inversion method are stuck with a closed and tortuous sponge-like pore structure. This closed and tortuous structure does not affect the water flux too much in pressure-driven processes, such as reverse osmosis, but it acts as the major barrier for water flux in forward osmosis processes." He points out that successful fabrication of an ideal FO membrane hinges on the removal of these bottlenecks. "If these can be achieved, this means the water flux could be increased dramatically, hence it will have a large commercial application to replace widely used reverse osmosis membrane processes for sustainable economic and environmental friendly development." In new work, reported in the June 3, 2011 online edition of Advanced Materials ("Nano Gives the Answer: Breaking the Bottleneck of Internal Concentration Polarization with a Nanofiber Composite Forward Osmosis Membrane for a High Water Production Rate"), Sun and his group describe a novel FO membrane that presents remarkable properties superior over conventional membrane support layers. "We fabricated a novel nanocomposite FO membrane with a scaffold-like nanofiber support layer that possesses remarkable advantages over conventional sponge-like support layers, such as 1) low tortuosity, 2) high porosity, and 3) very thin thickness," says Sun. "This unique structure of the nanofiber support layer guarantees direct paths for salt and water diffusion, which could provide a good solution for eliminating the ICP bottleneck." To fabricate their nanocomposite FO membrane, the team used electrospinning to first produce a porous nanofiber matrix as a support layer. In contrast to the sponge-like (closed pores) structure of traditional FO membranes, the nanofi ber support layer shows a unique, scaffold-like, porous structure with interconnected pores between individual nanofibers. a) A cross-sectional SEM image of a conventional polyethersulfone (PES) support layer using the phase inversion method shows the tortuous sponge-like structure. b) An overview SEM image of an electrospun PES nanofiber support layer. 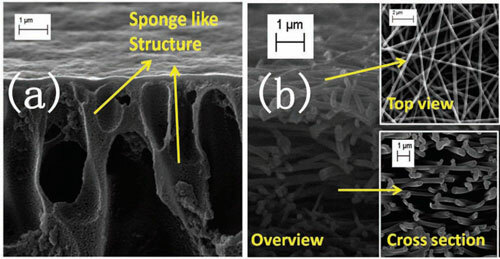 The top-view SEM shows the low-tortuosity and scaffold-like structure and the cross-sectional SEM image shows that the pores are interconnected in between individual nanofibers. (Reprinted with permission from Wiley-VCH Verlag). On top of both nanofiber and phase inversion support layers the researchers then interfacially polymerized a salt-rejecting polyamide active layer. Comparing their new nanocomposite FO membrane with commercial membranes, the team found that the water permeability of their membrane is about 3.5 times higher than that of HTI-FO membranes and 0.36 times higher than PI-FO membranes. 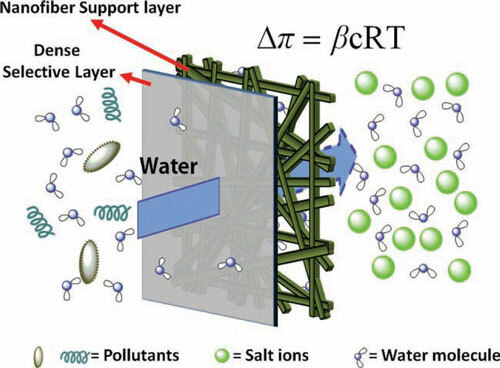 The salt rejection rate of the nanocomposite FO membrane is 97.0% ? 1.0%, similar to that of PI-FO membranes (96.5% ? 1.5%). Sun notes that, with these achievements, his research group is now working on new nanofibers for further improvements with many desirable properties, such as, hierarchical architecture, tunable hydrophilicity, adsorption ability, self-cleaning and modified top selective layer with sub-mesoporous materials to exhibit ion-selective and high flux performance.